Just days after winning the UFC middleweight title in the main event at UFC 217, Georges St-Pierre has already parted ways with the belt. 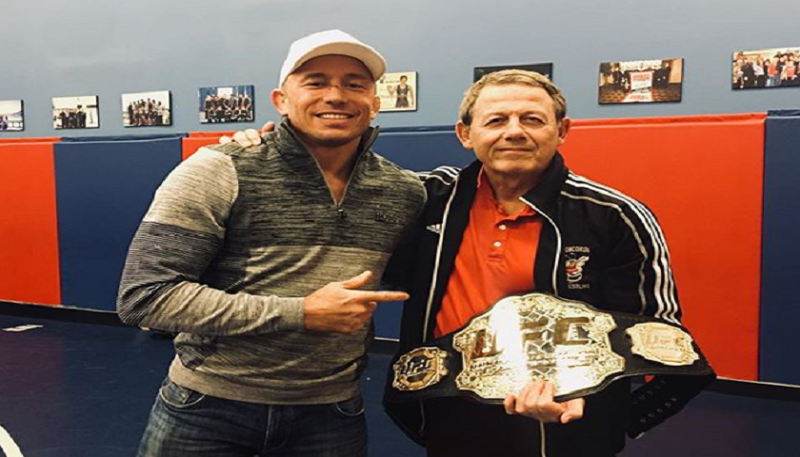 GSP posted the above comment on photo on social media. He did not exactly relinquish the UFC title, just gave this particular belt away to a mentor. J’ai enfin réussi à faire sourire coach Victor en lui offrant ce soir ma ceinture de champion du monde des poids moyens… Merci au Club de lutte de Montréal et YMHA pour votre aide depuis plus de 15 ans!!! Happy to give my new middleweight belt to coach Victor – I owe a big part of my success in the octagon to the Montreal Wrestling Club and YMHA! St-Pierre defeated Michael Bisping to capture the 185-pound belt. The fight took place at Madison Square Garden in New York, New York. GSP submitted Bisping via rear-naked choke in the third round. With the win, GSP becomes the fourth champion in UFC organizational history to capture titles in two weight divisions. He joins BJ Penn, Conor McGregor, and Randy Couture. The Canadian mixed martial artist is a two-time UFC welterweight champion and captured this most recent belt in his first fight after returning from a four year layoff. No official announcement has been made in regards to GSP’s next fight, although it is expected that a unification bout with interim champ Robert Whittaker will take place in 2018. Other possible options are a fight back down at 170 pounds against champion Tyron Woodley, or a super fight against either Anderson Silva or Conor McGregor. The possibilities seem endless now that one of the all time greats is back.